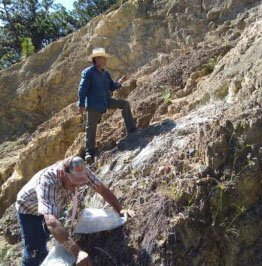 ASX polymetallic junior Pacifico Minerals (ASX:PMY) is a company that likes to keep itself very busy. The latest target on PMY’s radar is a deftly engineered acquisition that will see this proactive company explore for gold and copper in a resource-rich corner of Mexico that’s been touted as the ‘real El Dorado’. As revealed this week, PMY has clinched an option agreement to acquire Minera GS S.A. de C.V., a private Mexican gold mining and exploration company. In turn, this places in its hands the highly prospective Violin Project, which carries exceptional potential for a hefty gold-copper deposit. Location is everything here. 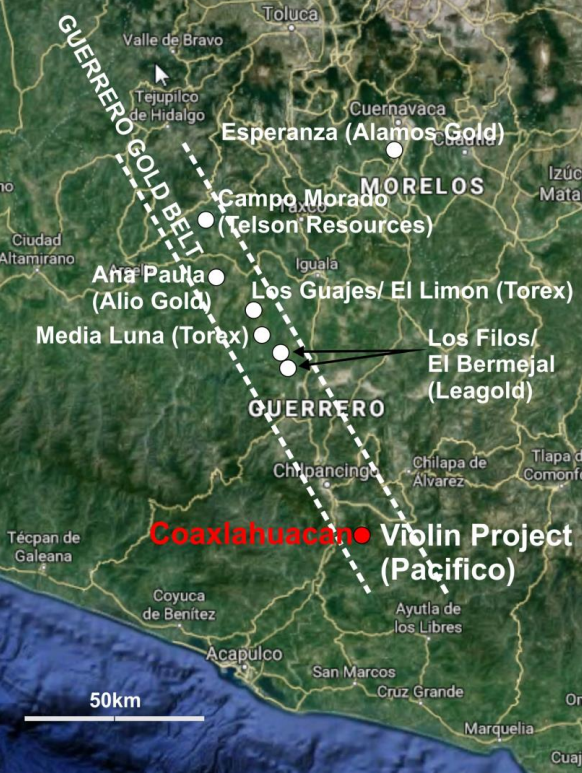 The Violin Project is situated in Mexico’s Guerrero Gold Belt, which hosts an array of multi-million ounce gold mines and developing projects. It’s some 250 kilometres south-west of Mexico City, and the nearest major town of Chilpancingo is a two hours’ drive away. The area is accessible via a network of tracks, all of which will bode nicely for PMY both in terms of upcoming exploration and a potential future mining operation, should it dig up something substantial. Exploration at the project to date includes in-depth geochemistry via 4,141 soil and rock chip samples, which covers most of the licence area. In addition, an IP survey and ground magnetics survey have also been completed. Major intrusive-skarn related mineralisation here is indicated by highly impressive gold and copper soil anomalies, as well as coincident magnetic highs. Especially intriguing is the Coaxlahuacan prospect, which carries the most interest for PMY as it moves forward. During the due diligence process, the company’s geological team noted extensive copper mineralisation in the form of chalcocite and malachite. All in all, this latest play makes for a strategic manoeuvre for the ASX small cap. PMY’s deep experience operating in Latin America has been invaluable in snapping up this covetable project, and it’s wasting no time moving forward. Although it remains an early stage play and therefore investors should seek professional financial advice if considering this stock for their portfolio. This fast-moving polymetallic junior plans to commence an aggressive series of exploration works immediately, with drill targets to be confirmed. Drilling will follow as soon as possible to advance towards establishing resources. On top of that, PMY has also been making sure-footed work of its Borroloola West Copper-Zinc-Lead-Cobalt-Silver Project in the Northern Territory. PMY’s JV partner on this project is the $1.21 billion-capped industry powerhouse, Sandfire Resources NL (ASX:SFR). This project covers a promising package of ground north-west of the McArthur River Mine, the world’s largest producing zinc-lead mine, and holds strong potential for the discovery of world-class base metal deposits. With JV partner Sandfire having confirmed they will pitch in their 49% for the upcoming aircore (AC) drilling programme at the Lorella prospect, a drilling contract has been executed and is set to kick off in a matter of weeks to test strike extensions of previously intersected oxide copper mineralisation and for indications of significant down-dip primary sulphide mineralisation. Reverse circulation (RC) and diamond drilling will then begin follow-up at Lorella to establish Inferred Resources of oxide copper. Between these high-impact works in the NT and its new acquisition in Mexico’s Guerrero Gold Belt, PMY is looking at a chock-full calendar in the weeks and months to come. Given PMY’s seasoned team and leverage to Sandfire’s horsepower, not to mention the upside potential we’re seeing across its dynamic project spread, it may not be long before investors cotton on to the full impact this $7.9 million-capped quiet achiever could have. 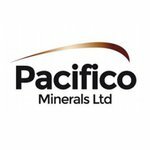 We last checked in with Pacifico Minerals (ASX:PMY) in November with the article, PMY Reports Highly Positive Copper Testwork Results. In that piece, we looked at the expedient work PMY was making of its NT operations, including the highly encouraging leach test work results that had been coming out of the Lorella prospect at Borroloola West. It bears mentioning that this past year has been good to PMY as it progressed its hard-hitting array of resource projects spread across some of the most prospective regions in the world. Spanning multiple continents, PMY’s portfolio boasts sizeable polymetallic potential which could prove immensely profitable as green technology continues to influence metals markets worldwide, while gold continues to drive safe haven investment at the same time. 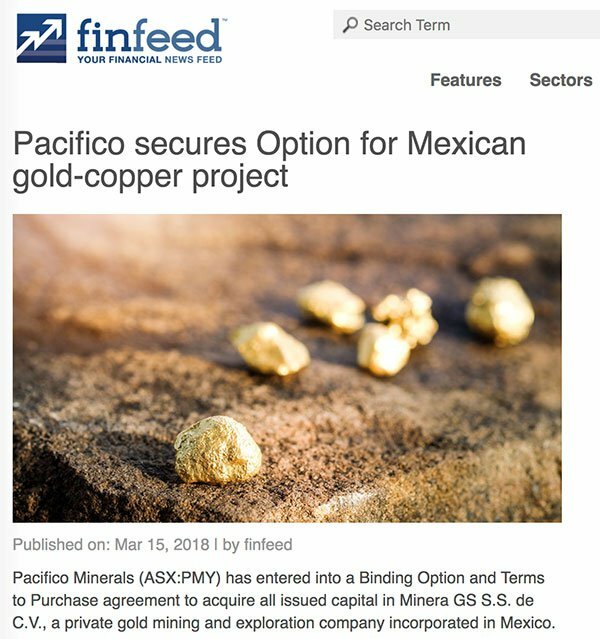 As PMY announced this week, it has snapped up a binding option and terms to purchase agreement to acquire all issued capital in Minera GS S.A. de C.V., a private gold mining and exploration company incorporated in Mexico. This agreement will give PMY the rights to the highly prospective Violin project, which has great potential for a large and significant gold-copper deposit. PMY will pay US$50,000 in cash plus 10,000,000 PMY shares for the sole and exclusive option to purchase Minera GS, including its attractive Mexican projects. For full details on the acquisition, you can take a look at PMY’s most recent announcement. Especially noteworthy are the Los Filos and El Bermejal open pit mines — some of Latin America’s largest gold mines. There’s no doubt that PMY has landed itself an enviable spot in a gold-emblazoned neighbourhood. It does, however, remain a speculative stock and investors should consider all publicly available information and take a cautious approach to any investment decision made with regard to this stock. As evidenced by the steady strides it’s made in Colombia, PMY has also leveraged its substantial experience operating in Latin America in securing this new project (for more information, we looked at PMY’s Colombian Berrio Gold Project in our last update). Mineralisation in the area is related to gold bearing iron skarn porphyries and occur within faults and as replacement deposits formed in and around the igneous intrusions. VMS-style massive sulphide deposits such as Telson Resources’ (CVE:TSN) Campo Morado also occur here. The Guerrero Gold Belt contains tertiary tonalite, granodiorite and monzodiorite porphyries intruded into cretaceous limestones and sandstones. Skarn zones exist between the igneous intrusions and the carbonate-rich country rock, and within them iron minerals dominate. These include magnetite, hematite and pyrite as well as quartz, sericite, clays, gold and copper sulfide minerals. The promising Coaxlahuacan target holds the most interest for PMY in terms of future exploration. 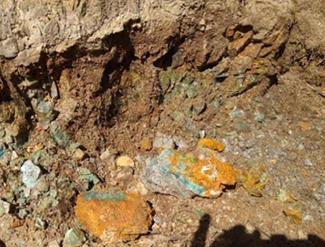 During the due diligence process, PMY’s geological team saw extensive copper mineralisation here in the form of chalcocite and malachite (which you can see in the image below). Based on these findings, PMY plans to confirm drill targets in the near future. 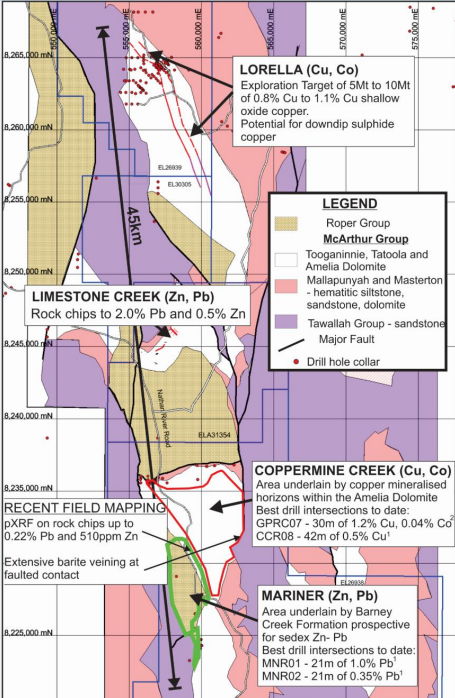 Visible observed surface indications of extensive copper gold mineralisation occur over an area of 500 x 100 metres in the lower lying anomalous area. Five check channel samples returning an average of 0.4 grams per tonne of gold and 0.70% copper. Pre-erosion weathering and leaching of the copper has resulted in the copper being detected in gullies only. The soils over this zone, which are open to the south, show an anomalous area of 500 x 300 metres that contains soil sample values of more 100 parts per billion of gold. A gold-only anomaly to the north and east of the above area lies within an area of saprolite cover. Within this zone, returns exceeding 50 parts per billion of gold are found over an area of 1.6 x 1.3 kilometres. The strength and extent of this gold in soil anomaly is highly impressive, suggesting that PMY has potential for a substantial tonnage of disseminated and stockwork gold (and probably copper, having been leached out near-surface) mineralisation. This anomalous zone is open to the north-west and to the south. 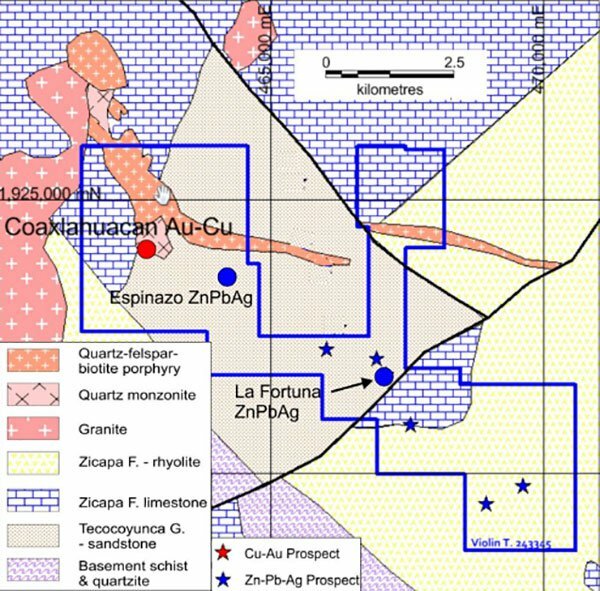 While PMY has so far prioritised this intriguing Coaxlahuacan prospect, it also has considerable interest in the Fortuna and Espinazo zinc, lead, and silver prospects which lie within the same tenement. Investigations at both of these sites indicate sedex-style mineralisation. At Fortuna, the average value of 10 dump and rock chip samples previously collected is 5.2% zinc, 4.5% lead and 220 grams per tonne of silver. All in all, this new acquisition is showing all the right indications, and PMY is wasting no time in mapping out a high-impact exploration plan. The company will rapidly confirm drill targets and expect to begin drilling in the near future, with a view to advance towards establishing Resources. In the Northern Territory, PMY is advancing its Borroloola West Copper-Zinc-Lead-Cobalt-Silver Project, which we looked at extensively back in November. This area is home to several world-class sediment-hosted massive sulphide deposits. These include the $15 billion capped Teck Resources’ (TSX:TECK.B | NYSE:TECK) world-class Teena zinc-lead deposit, the major zinc-lead-silver and copper deposit at Mt Isa, and the McArthur River zinc-lead-silver deposit. The latter is the world’s largest producing zinc-lead mine, and is just 25 kilometres east of the Borroloola West tenements. A fact that could boost PMY’s chance of discovering a world-class Resource once it completes the necessary exploration work. One central focus in PMY’s recent exploration activities has been the Lorella prospect. An exploration target of 5-10Mt of 0.8%-1.1% copper of oxide copper mineralisation has been estimated at this prospect. Leach testwork on the mineralisation indicates high copper recoveries and low acid consumptions and shows high potential for the development of a low cost leaching operation at Lorella. A drilling contract has been executed, with drilling to begin in early April – just weeks from now – at Lorella to test strike extensions of previously intersected oxide copper mineralisation and for indications of significant down-dip primary sulphide mineralisation. PMY’s JV partner, the $1.21 billion-capped Sandfire, will contribute 49% of the upcoming aircore (AC) drilling programme, which will test strike extensions of previously intersected oxide copper mineralisation and for indications of significant down-dip primary sulphide mineralisation. Reverse circulation (RC) and diamond drilling will then begin follow-up at Lorella to establish Inferred Resources of oxide copper. Mapping and geochemical sampling is also expected to commence in April to establish drill targets for sediment hosted primary zinc-lead mineralisation at the Mariner prospect. PMY will also look to advance its Limestone Creek prospect, where highly prospective RC/diamond drilling targets defined for primary sediment hosted zinc-lead will be drilled this year once the tenement has been granted. PMY is looking to move fast as it sharpens up its focus and advances it polymetallic project spread. Exploration work is to begin immediately at the newly acquired gold-copper Violin Project in Mexico, with the plan to commence drilling as soon as practical to advance towards establishing resources. There is a great deal to be done here, so investors should seek professional financial advice for more information if considering this stock for their portfolio. 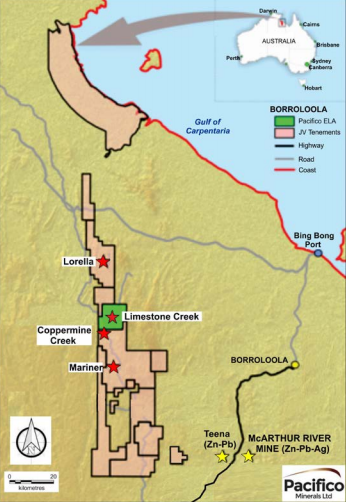 Meanwhile, at the Borroloola West Project in Australia, PMY is looking at a host of potential near-term catalysts, including back-to-back copper and zinc drilling programmes beginning in April, as well as the granting of a new highly prospective exploration licence containing high priority zinc targets at the Limestone Creek prospect. A critical component of PMY’s underlying strategy is its meticulous selection of high-potential projects in world-class districts, with a focus on a versatile, high-performing commodity mix. So far, this simple formula has served PMY very well indeed. With its new Mexican acquisition showing strong gold-hued promise and progress tracking along nicely across its whole polymetallic portfolio, there’s likely to be plenty of news flow from here, and we’ll be keeping a close eye on this $7.9 million-capped junior.